Stainless steel generally offers superb resistance to corrosion, chemicals, and heat. Tsubaki offers the following line-up of products taking advantage of stainless steel’s features. 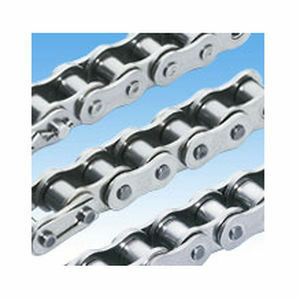 These chains are used in a wide range of industries, especially the food industry. 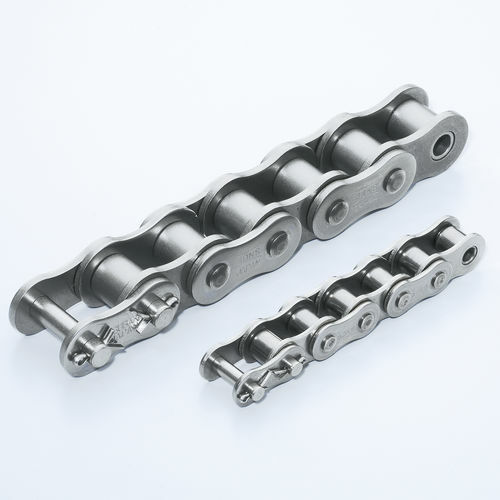 SS Series: Our basic stainless steel chain using SUS304 equivalent material. Perfect for use in water or in acidic, alkali, or other corrosive environments. NS Series: Uses SUS316 stainless steel for better corrosion resistance than SS Series. Use in situations requiring greater corrosion resistance than SS Series. AS Series: Pins and rollers use precipitation hardened stainless steel for 1.5x the maximum allowable load of SS Series. However, AS Series has less corrosion resistance than SS Series.